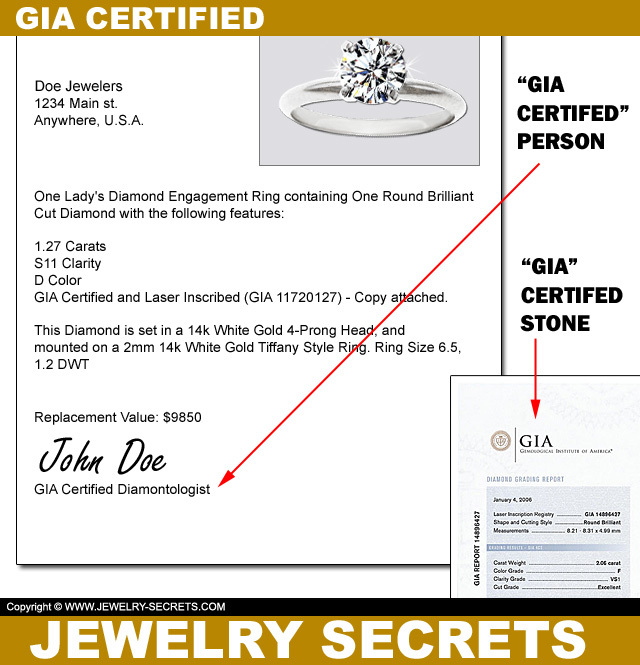 GIA IS NOT GIA CERTIFIED! COMPARE "GIA" TO "GIA CERTIFIED" DIAMONDS! They both sound the same, but aren’t. GIA is the Gemological Institute of America. They devised the 4C’s. They grade diamonds and give out the most accurate and strict diamonds reports in the world. And then we have “GIA certified”. A jewelry store can sell a stone, stating that it’s “GIA certified“, without GIA ever looking at that diamond. Because GIA has diamond courses called “Graduate Diamonds Program“, that allow someone to go through the course, test at a facility, and become “GIA certified” themselves. Which means; they have graduated as a Diamontologist and have GIA’s stamp of approval to grade diamonds and detect diamond synthetics, treatments, and simulants. They will be able to make more money being a “GIA” graduate. They can work in the jewelry industry as an appraiser, gemologist, or in-store diamond expert, or even go on to own their own store (although it’s not needed). But the cool thing is, they can grade and evaluate stones at their convenience. Which also means, they may know and understand GIA’s extensive grading system. They may be accredited and respected, but they are still one person. It’s their opinion on what that particular stone is. When GIA grades a diamond, they use “triple redundancy“, which is at least 3 experts agreeing on a grade. But one person gets one opinion, and that opinion may be influenced by their eye-sight, money, the surrounding atmosphere, the lighting source, or even their moods. In other words, their opinion may not be as accurate as GIAs would be. So if you, the consumer, are looking at diamonds and the salesclerk, website, or catalog lists the stone as “GIA certified“, find out exactly what that means. For it may not be a shiny, new, laminated, hologrammed, or security sealed report like this one (as compared to a “jewelry appraisal” that was appraised by a “GIA” certified individual. It could even have a value on it! So if you truly want a GIA certified diamond (like these diamonds here), do make sure it’s from GIA. And not someone who’s taken a course, and may be good at passing tests.